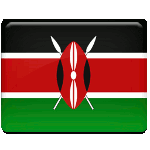 Jamhuri Day, also known as Independence Day or Republic Day, is a Kenyan national holiday celebrated on December 12. It commemorates two events: the independence of Kenya from the UK in 1963 and its establishment as a republic the following year. Kenya became a British colony in the late 19th century. At the time, it was known as East Africa Protectorate or British East Africa. During the First World War, Kenya became a British military base. After the war the protectorate was transformed into the Colony and Protectorate of Kenya, a British crown colony. Independence struggle in Kenya began after the Second World War. One of the most important events of that period was the Mau Mau Uprising that began in 1952. Although it was suppressed, it was an important step toward independence. Kenya became independent on December 12, 1963 as a Commonwealth realm and was established as a republic a year later. Jamhuri Day is Kenya's most important public holiday. The world “Jamhuri” is translated from Swahili as “republic”. The holiday is celebrated with numerous festive events and activities held throughout the country, including (but not limited to) military parades, political speeches, cultural events, feasts, etc. Due to its date, Jamhuri Day also marks the beginning of the Christmas season.